Baklavas is one of the best Greek desserts, which is a rich, sweet pastry made of layers of phyllo, filled with chopped nuts with spices among the layers and drenched with syrup. Today’s recipe is a twist on the traditional recipe which is made in a Tart pan, drenched in honey syrup, with Chocolate ganache on top. Really, who can resist a dessert like that, especially if you are a chocolate lover like I am? I’ve made Baklavas innumerable times, considering that it is one the desserts I used to make in the restaurant I used to work in. I’ve made quite a few tweaks to the classic recipe, either using nuts and spoon sweets (quince) or adding pastelli combined with more nuts. You can use any nuts you prefer or a combination of several nuts, such as almonds, walnuts, pistachios, peanuts, hazelnuts etc. Preheat oven to 180oC / 350o F. While the oven is preheating, toast the walnuts and almonds, for about 15 minutes and set aside to cool. When they cool pulse them in a food processor with a couple of spins to make coarse pieces. Add the bread crumbs, cinnamon, cloves and cane sugar to the nuts, mix and set aside. While the nuts are toasting, prepare the syrup. Put the honey with water as well as spices in a small pot and mix until honey has dissolved. Bring to a boil and cook for 5 minutes. Remove from the heat and discard the spices. Remove 8 sheets of phyllo and put the tart pan on top. Lightly score the phyllos 2.5 cm (1 inch) away from the tart pan and with a scissors, cut round sheets of phyllo. Brush the tart pan with butter. Brush two sheets of phyllo and place one on top of the other. Using the brush, arrange them to sit on the tart pan. Sprinkle 1/4 of the nut mixture on top. Place another phyllo, brushed with butter on top and press it with the brush to sit over the nuts. Add the next ¼ of nuts and another sheet on top, brushed with butter. Continue with two more following the above procedure. Finally add the remaining two sheets, each one brushed with butter. Using the brush arrange the edges of the phyllo, tucking them inside to form the side of the tart. Brush the top with butter. Reduce the temperature to 160oC / 320oF and bake for 25 – 30 minutes or until golden on top. While it is baking prepare the ganache. Place a double boiler (bain mari) on the heat and add the heavy cream. When the water starts boiling add the chocolate, cut into pieces and mix until it starts melting. Add the honey, salt and pepper and continue mixing until it melts. When the baklavas is ready, remove from the oven and using a spoon wet the surface and sides of the tart with the cold (or lukewarm) syrup. Set aside until the syrup is absorbed. Add the chocolate ganache on top and if you like you can decorate it with Cherry Preserve or toasted walnut halves. Note: As nothing goes wasted in my kitchen, leftover phyllo pieces can be made into this easy Tyropita. When I made this tart again, I added a few drops of raspberry essence in the chocolate ganache, which made a huge difference to the taste of the chocolate layer. It tasted amazing! I would suggest that if you have a tart pan with a deep indentation, it is preferable, after the syrup dries, to reverse it and put the chocolate on top, as it makes it look much prettier! Today I have great news to share with you. BHMAgourmet, a Greek magazine, is hosting the First Food Blog Awards and my blog has been nominated in the category “Best Greek cooking in English”. 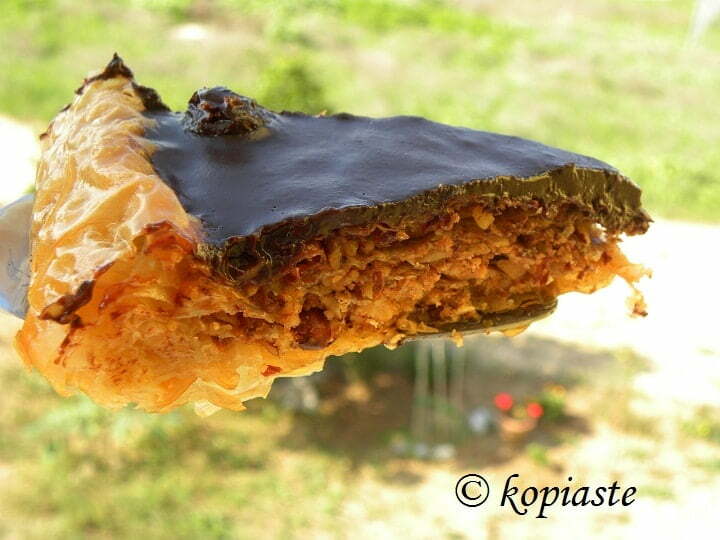 Thanks for sharing step by step guide for how to make best chocolate honey baklavas tart.. I am going to make it. After i’ll inform you how it was.. Thanks for explain each and everything very nicely..
A calorie bomb, but it surely is very delicious with all the nuts and chocolate. Congratulations, Ivy and I just voted it for you. You saved my day. 3 days after My wife’s birthday is there. So I am planning to make such chocolate honey tart :-p Wish me luck for my cooking skills. Thanks for showing the step by step recipe. Wow, chocolate on Baklavas! I am drooling!